Steep sustained climbs and descents. In sections, there are little to no shoulders on the road. Caution advised during summer months as many motorists sightsee along this route – particularly near Emerald Bay. There are many access points for this ride. Local road cyclists, living along the North and West shores of the Lake, enjoy an Out/Back ride along Hwy 89 (West Lake Blvd.) from Tahoe City to Inspiration Point overlooking Emerald Bay. The ride offers a great combination of sustained climbs, high speed descents, and some of the most inspirational vistas in the region. The ride passes many opportunities for refreshments, relaxation or just get aero and spin. Bike Camp. 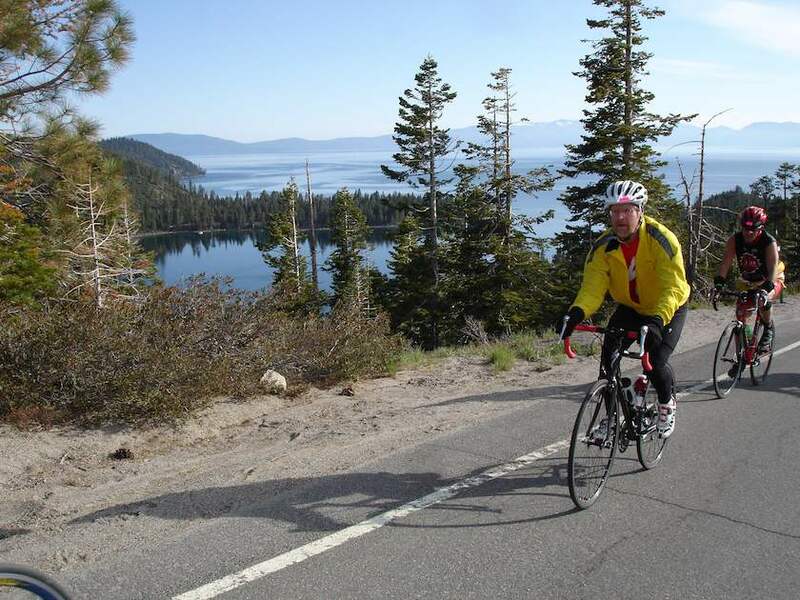 You can break up the ride and take a couple of days to bike camp at several of the best campgrounds in the Tahoe area: Sugar Pine Point State Park, Meeks Bay Campground, D.L. 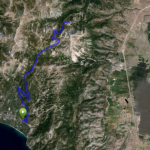 Bliss State Park, Emerald Bay Campground, and Eagle Point Campground. 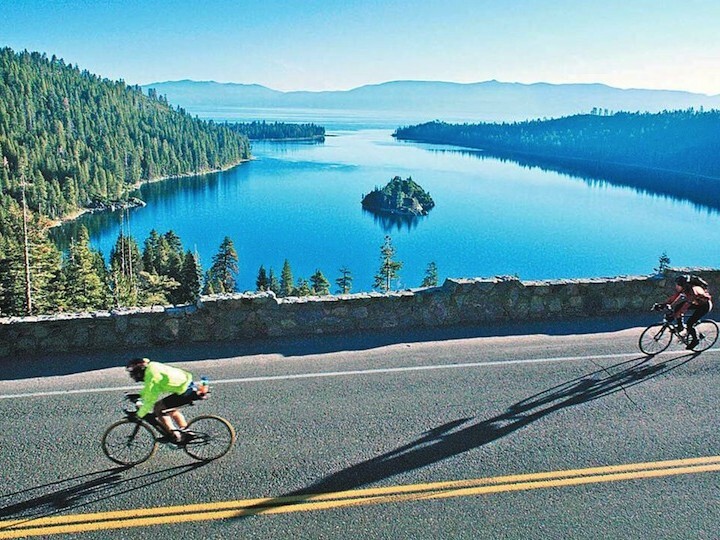 Inspiration Point is on the southwest end of Emerald Bay and overlooks this world famous National Natural Landmark. Hellman Ehrman Manson, Sugar Pine Point State Park. This is one of grandest Old Tahoe mansions in existence today. The 11,700 square foot summer home, called Pine Lodge, was built by San Francisco banker Issaias W. Hellman and designed by Walker D. Bliss. It’s located on a bluff overlooking the Lake. It was completed in 1903 and is one of the finest examples of Tahoe elegance at the turn of the century. Vikingsholm, Emerald Bay State Park. Vikingsholm (Viking’s Castle) is a 38 room mansion constructed at the base of Eagle Falls in 1929 by 200 workers and is considered one of the finest examples Scandinavian architecture in the U.S. Vikingsholm was built by Mrs. Lora Josephine Knight as a summer home. It has a traditional sod roof and some parts of the structure contain no nails or spikes. Out in front of the mansion is the only island in Lake Tahoe, Fannette Island. Mrs. Knight had a stone tea house built on the island and its structure remains today. While Mrs. Knight is best known for Vikingsholm, she and her husband were primary backers of Charles Lindbergh’s non-stop solo flight, “Spirit of St. Louis”, across the Atlantic in 1927. Now, part of the Emerald Bay State Park, tours are available during the summer months showcasing the architecture, interior furnishings, and tapestries that are reproductions dating back to the 1700’s and 1800’s.